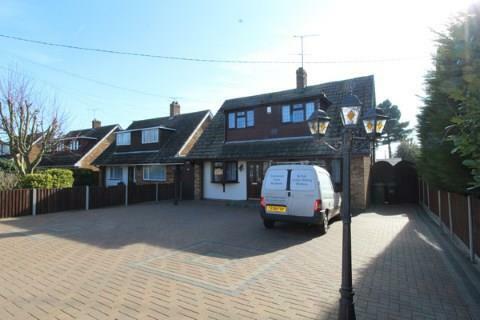 3 Bedroom Detached House For Sale in Chelmsford for Asking Price £575,000. Guide price 575,000 - 600,000. This well appointed, three/four bedroom detached chalet style house is presented to the highest standard with upgrades including a stunning bathroom, and bespoke kitchen breakfast room. The ground floor accommodation comprises of a large lounge, separate sitting room, a cloakroom, a bespoke quality kitchen breakfast room opening onto a dining area with bi-folding doors opening out onto the well manicured rear garden. The first floor is home to three double bedrooms, with en suite to the master, and a fourth bedroom/dressing room. The bathroom has been upgraded to the highest of quality and really must be viewed to be appreciated. The rear garden is in excess of 150ft and has recently been landscaped by the owners providing a great entertaining area with hot tub( which is staying). The frontage benefits from off street parking for multiple vehicles along with potential for a boat and caravan..